Since many of us are sending our kids back to school, I wanted to share some ideas on how we might do that as a #momsetfree. I hope you enjoy it and find some relief from the stress as you read it! I'm guessing you've picked up on a theme in my writing lately. You probably know by now that I love writing about the things we’ve been set free from. We’ve been set free from the pressure to be perfect, the striving to be enough, and the need to control the outcome of all we pour into our kids. We’ve been set free from the power of sin, the sting of shame, the grip of guilt, and the weight of our worries. And so much more. 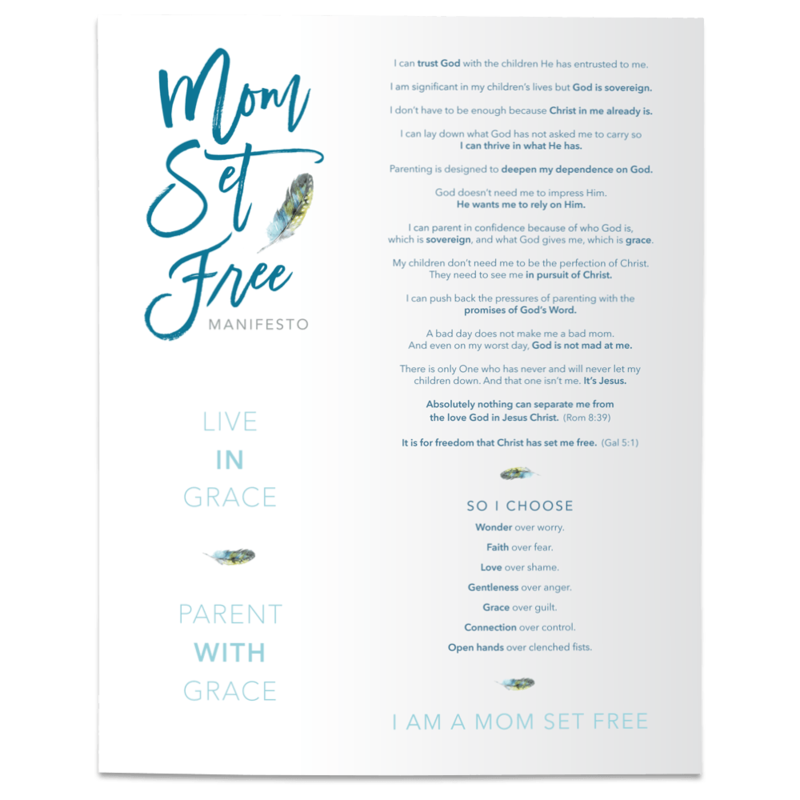 But today I thought it would be fun to chat on the blog about what we have been set free for, because even though I don’t write about this as often, I do sense it holds equal significance for us as moms. My husband, Mike, and I had one of our biggest fights on Mother’s Day. We’d recently moved from our tiny apartment in NYC to a small town about an hour north in Connecticut. The thing I missed most about living in the city was the bagel shop I’d frequented several times a week. There's a familiar pressure trying to make it’s way back into my heart. So I’m calling it out and sharing it with you in case you know this one too. It’s the one that whispers, “Your child’s path is decided by how well you parent.” It’s not surprising that these pressures (aka lies) come creeping back. There’s enough messaging in our culture to make us feel like it’s all riding on how well we perform as parents. But strangely enough, this specific pressure once stemmed from me taking scripture out of context. When our oldest son turned thirteen we wanted to do something special for him - something that would help him see himself through God’s eyes of love and mercy. So we asked a group of men, who know our son well, to write him a letter. We asked that they do two things. First, we asked them to share what they see in him. We wanted them to speak words of life over our son. And we also asked them to share their wisdom about what God has taught them through both failure and success, and how life works best. Growing up as a preachers kid, I have very fond memories of Easter. The church where my Dad pastored always held a Good Friday service that I can remember vividly, even now. The most memorable part being when we would walk up the front, as one would do to receive communion, but on Good Friday, my father would also place a nail in our palm. A nail like the one that was driven into the hands of our innocent Christ. Friend, You are SET FREE for freedom! I pray and hope that this month has been an opportunity for you to truly discover how the promises of God empower us to parent in the assurance of His sovereignty and grace! At the end of a difficult day, when our weaknesses have been underlined AND highlighted in the ways we have parented our kids, it can be all too easy to believe the lie that a bad day makes us a bad mom. So if you’ve had some difficult days lately, and the enemy has tempted you to think that anyone and everyone could be doing a better job parenting your kids than you, can I encourage you today.